If you yearn for the beach but live miles inland, you can re-create the look easily in a garden pot. Find a low wide pot or bowl, that is approximately 14" in diameter. It can be made of terracotta clay, ceramic, poly-resin, concrete or any other type of planter that you like. Partially fill the bowl with new potting soil. Set the plants you purchased still in their nursery container on the soil, and move them till you find the position that you really like. Make an arrangement that makes you happy! Use 4" slow growing plants, approx 3. Knock the plants out of the nursery containers and gently take the coiled roots apart. Fill in around them with more potting soil up to within an inch of the pot rim. Make sure the soil is compact and then water till moist. 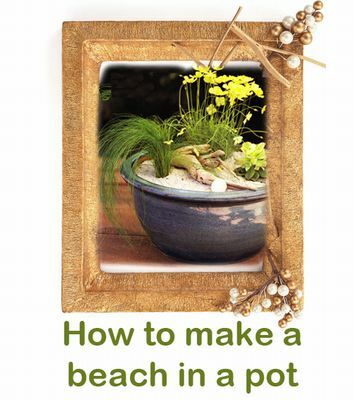 Pour sand on top of the soil and finish with a piece of driftwood or other beachy treasure. Shells, and sand-dollars make interesting pieces to add. Set the finished pot on a sunny patio or porch, where it gets some sun and some shade. Water once a week or so using a gentle stream of water. You don't want to disturb the display. A watering can comes in handy here.